Just after Christmas I was in the car, singing the ‘Gower Wassail’. When I finished, without thinking, I found myself launching into this one, which I’d not sung for a very long time. The link of course is that both were collected from the “Gower Nightingale”, Phil Tanner. But just as I first heard his Wassail song performed by Steeleye and the Watersons, I first encountered this one on Mike Waterson’s eponymous 1977 LP. I actually learned the song from Roy Palmer’s book The Rambling Soldier. Roy takes three of Phil Tanner’s four verses, and completes the story with additional verses from a late nineteenth century Harkness broadside. There are many broadside printings of the song listed in Steve Roud’s Index, but few from the oral tradition – besides this one from Wales, there’s just a handful of examples, from Scotland, Northern Ireland and Canada. You can hear brief recordings of a couple of Canadian versions on the website MacEdward Leach and the Songs of Atlantic Canada here and here (they look like blank pages at first, but scroll to the bottom and you’ll find a transcription, sheet music and audio). The song’s setting is by no means fixed to Swansea – indeed many of the printed examples allow the singer to substitute the place name of their choice, such as this one from Lucy Broadwood’s collection. The Lass Of —- Town. 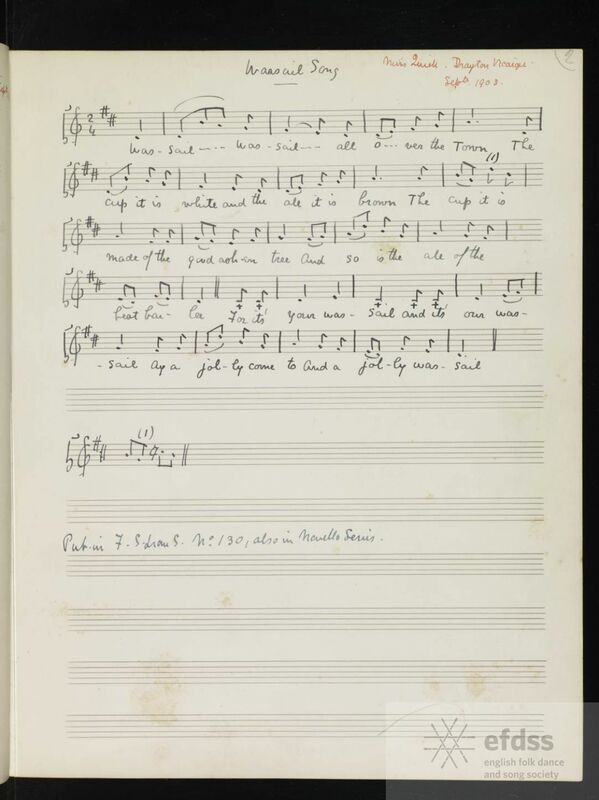 From the Lucy Broadwood Manuscript Collection, via the EFDSS Full English archive. Cuper’s Gardens were 17–18th century pleasure gardens (aka a tea garden) on the south side of the River Thames in Lambeth, London, looking over to Somerset House near where Waterloo Bridge is located (centered on what is now the north end of Waterloo Road). In 1643, Thomas Howard, 21st Earl of Arundel bought three acres of land which he leased to his gardener Abraham Boydell Cuper. The gardens opened in the 1680s and were named after the original proprietor. They were also known as Cupid’s Gardens. In 1686, seven acres of adjoining land was bought from the Archbishop of Canterbury, William Sancroft, and added to the gardens. A long landing stage in the river known as Cuper’s Bridge acted as a popular entrance for the gardens. Since it is emphasised that “the other was a virgin” I think we can assume that lovely Nancy was not – and was known not to be; more than that, that she was, shall we say, a lady of easy virtue. The song appears to have been widely sung, although apart from one solitary Yorkshire version, all the examples in the Full English archive come from Southern English counties – Essex, Kent, Sussex, Surrey, Middlesex, Wiltshire, Dorset, Somerset, Devon and Cornwall. This may be more a reflection of the Southern bias of early twentieth century collectors, rather than any indication of the geographical spread of the song. 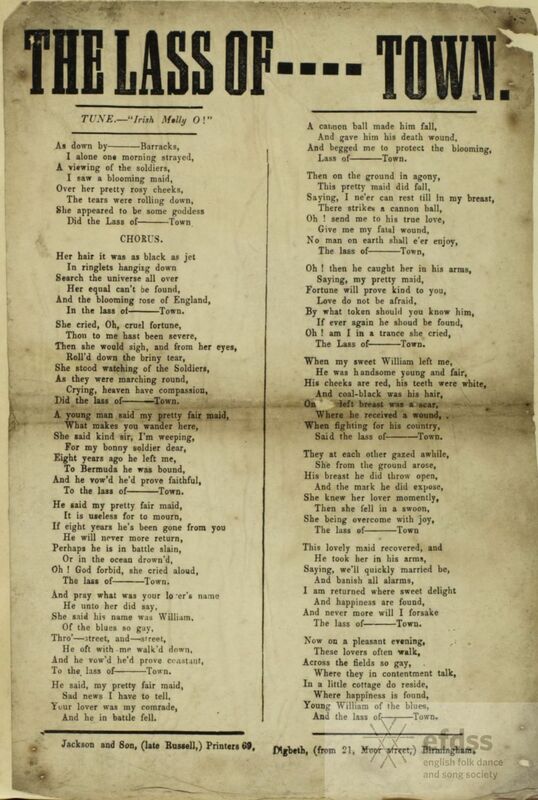 Unsurprisingly, there are numerous printed versions at Broadside Ballads Online, while the ballad sheet shown below is from the collection of Frank Kidson, the Yorkshire folk song collector. 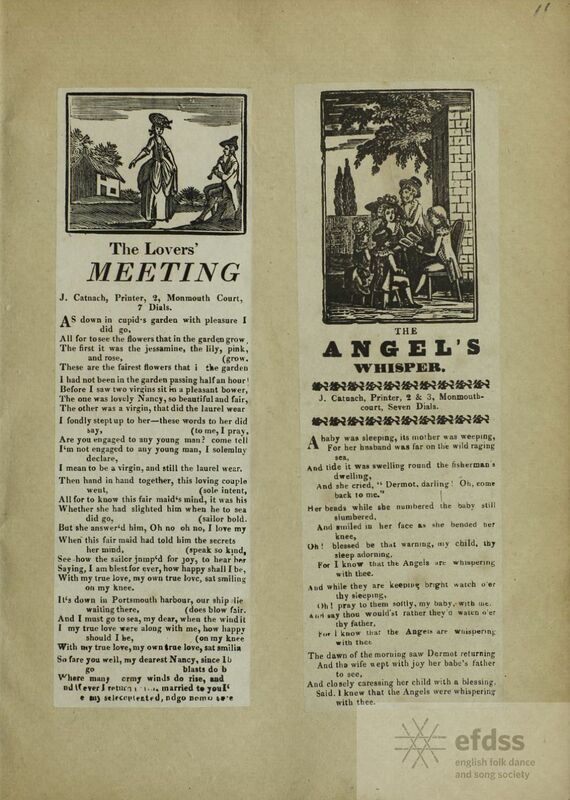 The Lovers’ Meeting – broadside ballad from the Frank Kidson Manuscript Collection, via the EFDSS Full English archive.